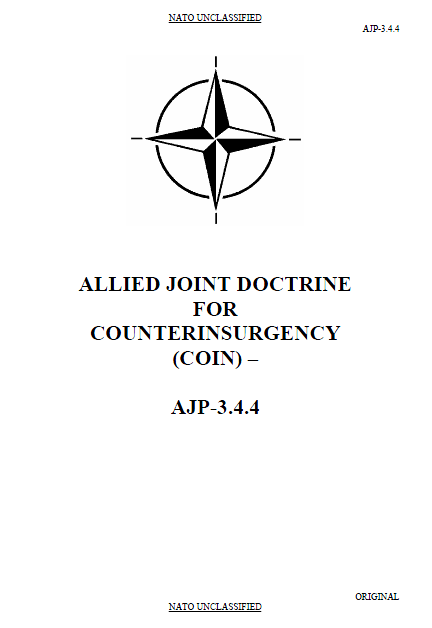 AJP-3.4.4 provides a common NATO doctrine to guide commanders, staffs and forces engaged in the conduct of COIN. It also informs civil actors involved in security and stabilisation of the full range of capabilities that the military may contribute to a joint, interagency and multinational response to the resolution of such ‘wicked problems’. AJP-3.2 ‘Allied Joint Doctrine for Land Operations’ provides the doctrinal underpinning for the counterinsurgency (COIN) campaign theme and its relationship to the conduct of operations across the full range of military activities. AJP-3.4 ‘Non-Article 5 Crisis Response Operations’ (NA5CRO) describes the considerations relevant to the successful conduct of various types of complex operations, insurgency being one of the identified irregular threats that the Alliance has to counter. This document aims to inform and guide the planning and conduct of NATO counterinsurgency. It is based on the assumption that a decision to launch NATO or NATO-led operations involving COIN will be taken in accordance with the relevant provisions of international law. It is also based upon the assumption that the conduct of COIN operations will have to conform to relevant international law. Any provisions, definitions or obligations in this AJP may not be interpreted or construed as state practice or a change in effective agreements on the law of armed conflict (LOAC). 09. Insurgency is defined as the actions of an organised, often ideologically motivated, group or movement that seeks to effect or prevent political change of a governing authority within a region, focused on persuading or coercing the population through the use of violence and subversion.3 Conversely, COIN is defined as the set of political, economic, social, military, law enforcement, civil and psychological activities with the aim to defeat4 insurgency and address any core grievances.5 However, efforts taken to counter an insurgency cannot ignore the destabilising effects of irregular activity. For the purpose of this publication, irregular activity is defined as the use or threat of force by irregular forces, groups or individuals, frequently ideologically or criminally motivated, to effect or prevent change as a challenge to governance and authority.6 Insurgency and COIN are distinctly different but cannot be looked at in isolation; nor can countering an insurgency ignore the impact of irregular activity and its destabilising effects. Insurgents seek to force political change on those in political power, whereas counterinsurgents seek to check insurgent activity and its associated irregular activity, so fostering perceived legitimacy of the HN government. 10. Both insurgents and counterinsurgents employ varied tactics and methods. These include political, military, economic, social, information and infrastructure activities (ways), in an attempt to reach a favourable outcome (ends) and within the resources available, including time (means). If this broad array is generally categorised as political and military in nature, political considerations are of much greater importance than military considerations in a struggle for the consent of the population. Therefore, every action in COIN should support a political resolution to the problem. This is particularly important when considering those organisations that contribute to humanitarian assistance and economic development efforts, some of whom operate in an impartial and neutral manner. When viewed through the lens of an insurgent these activities are unlikely to be perceived as neutral because they promote the legitimacy of the HN government. This presents a dilemma to the HN and the Alliance and provides the insurgent an opportunity to exploit such vulnerabilities. Unity of purpose and unity of effort are essential for the multiplicity of actors engaged within a COIN environment and such a coordinated approach must be nurtured and safeguarded. Civil authorities should normally have the lead for delivering internal security and stabilisation. However, the lack of a permissive environment may require military forces to contribute more widely to security and capacity-building tasks. As a result the military contribution may dominate the early phases of a campaign during the contest to deliver a favourable security environment that protects the population. The aim of such activity is to foster HN government capacity and legitimacy, build human security and stimulate economic activity. Tasks that may fall to the military include: providing security for the population, restoration of essential services, support to economic and infrastructure development, establishment of interim governance and security of communication. This military contribution within a unified and comprehensive approach sets those decisive conditions that allow security and stabilisation to flourish and sits at the heart of the COIN campaign. Civil and military actors must work together in a coordinated and integrated manner. Part of the military contribution is likely to involve countering a mix of insurgency, terrorism, criminality and disorder. For this reason, the threats to the security and stability of a state or region, and the variety of tasks the military may be called upon to perform, are wide-ranging. The military increasingly operates alongside a proliferation of multi-agency and multinational actors to deliver a secure and stable environment. Increased globalisation, changes in international systems, complex sovereignty issues, and the increasing number of transnational actors who seek to influence international outcomes and the governance of global affairs, demand a new approach. While stability remains the decisive condition, the platform without which the state cannot prosper, the provision of security is the key element in delivering an enduring political settlement. Within this context, COIN represents an important aspect of the overall military contribution at the tactical level and demands the employment of the full range of military activities7; the application and employment of which must be guided by the “attributes of COIN”. The likelihood of success in a COIN campaign is a function not simply of the application of coherent military power against an opponent, but also of a range of wider factors, such as the uncertainties induced by unpredictable events, the interplay of chance and the vagaries of human nature. It is therefore crucial, in order to identify opportunity and risk, that commanders understand fully the context in which military power is to be applied and the type of campaign in which they are engaged. Only then can commanders shape the situation to their advantage, learning, adapting and anticipating as the campaign evolves. An insurgency usually requires two key conditions in order to flourish: core grievances and prerequisites. a. Identity. Many factors impact a person’s sense of identity, but identity is socio-cultural in character. Strong feelings based on identity can be in conflict with the views of the HN government, potentially leading to insurgencies aimed at secession, border changes, or political overthrow. External actors with similar identities to the insurgents may assist. b. Religion. Religious extremism can become a core grievance of an insurgency. External groups with similar extremist religious views to those of the insurgents often provide support. c. Economy. Pervasive and desperate poverty often fosters and fuels widespread public dissatisfaction. Young people without jobs or hope are ripe for insurgent recruitment. Additionally, a perceived disparity in people’s means can be an economic core grievance, for example, a gap between a large poor majority and a small wealthy minority. d. Corruption. The corruption of national politics, the HN government, or key institutions or organisations can be a core grievance. Institutional corruption is unfair or illegal actions or policies. Political corruption is the dysfunction of a political system. For example, corruption in government development programmes can cause resentment within the aggrieved group. Corruption leads to a loss of HN legitimacy and is often a key core grievance. e. Repression. Repression can take many forms, such as discriminatory policies, rights violations, police brutality or imprisonment. Like corruption, repression can lead to popular dissatisfaction with the current government and leads to the reduction of HN legitimacy. f. Foreign Exploitation or Presence. The perception of outsiders exploiting the HN, or of the HN government excessively pandering to foreigners, can be a core grievance. For example, if foreign businesses dominate critical portions of the local economy, some of the population may feel that they or their country are being exploited by outsiders. A foreign military presence or military treaty may also offend national sentiment. Finally, the mere presence or specific actions of foreigners may offend local religious or cultural sensibilities. g. Occupation. Foreign military forces’ occupation of another state is often a core grievance. If groups within the population have the will to fight on after a regime change or occupation, they may form a resistance movement. h. Essential Services. Essential services provide those things needed to sustain life. Examples of these essential needs are the availability of food, law enforcement, emergency services, water, electricity, shelter, health care, schools, transportation, and sanitation (trash and sewage). Stabilising a population requires these basic needs to be met. People pursue essential needs until they feel they are met, at any cost and from any source. People support the source that meets their needs. a. Vulnerable Population. The greater the expectation of the population, the more vulnerable it will become to alternatives for change. Insurgents can exploit political, economic or social dissatisfaction with the HN or local government and offer the population hope for change. b. Leadership Available for Direction. Exercising leadership in an insurgency is a complex issue and can be centralised or decentralised. There may be a transition from one form of leadership to another. Insurgency leadership has traditionally been perceived as centralised around a charismatic, persuasive and politically astute figure following a single narrative. Contemporary leadership in a globalised environment, with increased use of information technology, has enabled greater decentralised execution. c. Lack of Government Control. If insurgents operate with little or no perceived interference from security forces or other agencies, the population may feel the government lacks control and fear the potential for chaos, both undermining legitimacy of the government. The greater the control the government has over the situation, the less likely are the chances for insurgent success. The success of a government ultimately depends on the acquiescence, if not the active support, of the population. The aim of both sides is to secure this, and here the insurgents’ task is easier, because they can choose the time and place for their actions and can orchestrate actions, including propaganda and measured violence, that will undermine the government more than they alienate the population. Notwithstanding, some insurgents are prepared to use brutality and terror to meet their needs.